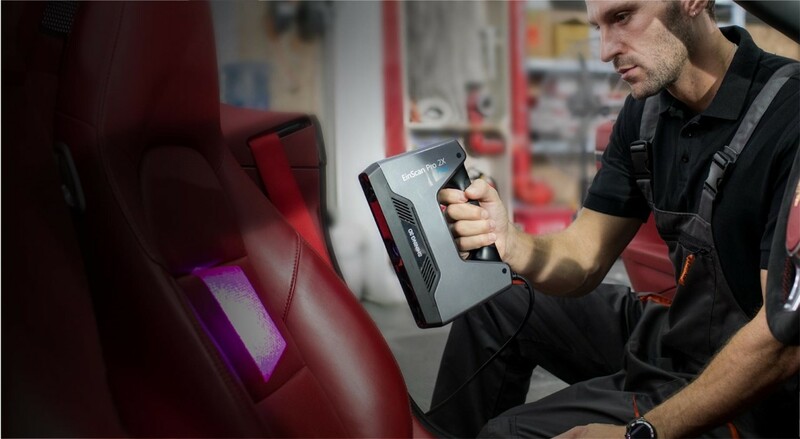 One of them is Shining3D, which is releasing new versions of their EinScan-Pro handheld structured light 3D Scanner: the EinScan-Pro 2X and 2X Plus. These are the succesors of the EinScan Pro (Review) and EinScan Pro Plus (Review). While the 2X comes in the same light silver color as the original Pro, the 2X Plus comes in a darker grey color as you can see above. As with the previous generation, the main difference between the 2X and 2X Plus is the single scan area (135x100mm – 225*170mm vs. 208x136mm – 312x204mm) and the working distance (400 vs. 510mm), making the 2X Plus better suitable for scanning larger objects. 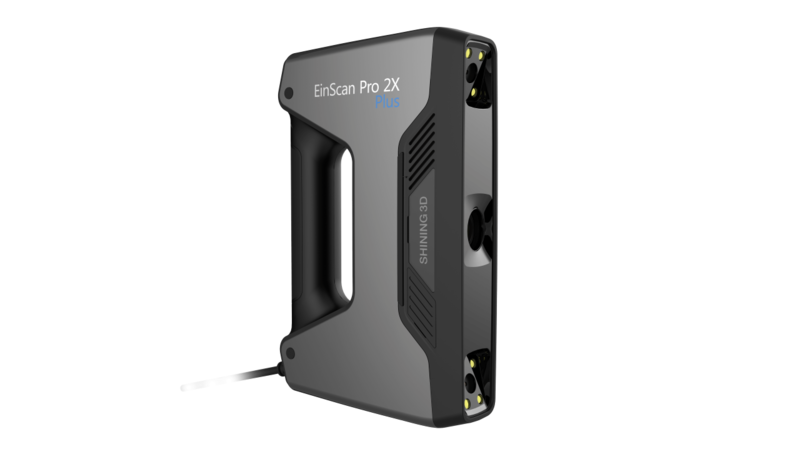 The main upgrade of the 2X series is the scanning speed, which is now 30 frames per second — twice as fast as the original EinScan Pro. If you’ve ever used a handheld 3D scanner you’ll know that a faster frame rate means a more fluid scanning experience, more robust tracking and of course shorter scanning times. This is great for large objects but also for subjects that are prone to movement, like scanning people. The Prime Pack (which I reviewed a few days ago), which makes the HD Handheld Mode faster and more robust. 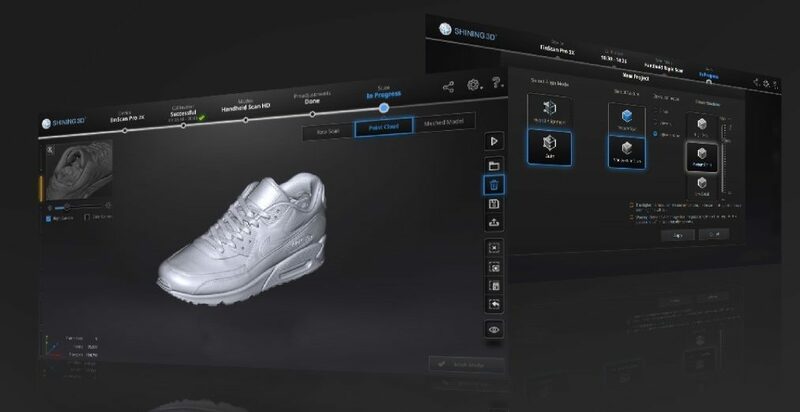 The 2X series come with a new kind of software, called ExScan Pro which features a completely redesigned user interface and promises faster scanning and more features. I’ve only seen the screenshots above but it looks like a big improvement over the existing EinScan software. More information about the EinScan 2X series of handheld structured light scanners can be found on the EinScan website. I’ll be doing a full review of the Einscan 2X (Plus) in the future. Follow me on Facebook, Instagram or LinkedIn to know when. The einscan pro is the new advanced devices in the field of 3d printing and scanning and it is also more useful than any other 3d devices and it can be used anywhere at any time. Write some more article on more products sir, it would be very useful for us, also thanks for this one. Have you reviewed the peel 3d scanner yet? I’d be interested to see how it compares to the Einscan products. Love your posts and reviews about 3D-scanners! Any time soon you will do the Einscan Pro 2X review? It seems interesting going through this post and to know about the newly launched device. The features that the device is designed with is amazing and exciting too. Reading this I am finding this interesting to get one for myself.